Aims & Objectives The aims and objectives are to promote friendship amongst members of the Club, and any other activities for their mutual benefit. MEETINGS 2nd & 4th WEDNESDAY OF EACH MONTH 10.00am for 10.30am at the VINE HOTEL, Drummond Road, Skegness. RULES (Revised 1/2010) 1. TITLE. The Club shall be called 'THE PROBUS CLUB OF SKEGNESS' 2. CONSTITUTION. There shall be a President, Immediate past President, Senior Vice President, Junior Vice President, Secretary, Assistant Secretary, Treasurer, Assistant Treasurer and Almoner. The affairs of the Club shall be managed by a Committee of these Officers and six others, to serve in office for one year commencing after the Annual General Meeting. Six members shall constitute a quorum. The Committee shall have the power to co-opt a member should this be necessary. Members are encouraged at all times to consider offering themselves to serve as Officers or Committee Members. Nominations must be handed to the Secretary duly proposed and seconded at least 14 days before an Annual General Meeting. 3. MEMBERSHIP & QUALIFICATION. The total membership of the Club, unless otherwise determined at the Annual General Meeting, shall be limited to ninety, excluding any Honorary Members. Membership shall be open to retired Professional and Businessmen who reside within the Skegness and District area. Every applicant for membership shall complete the official application form for consideration by the Committee, and shall be sponsored by a Proposer and Seconder, who shall be existing and fully paid-up members of the Club, and who shall sign and counter­sign such application. The Committee may in its absolute discretion, and without being called upon to give the reasons for the exercise of such discretion, reject any application for membership, either before or after the interview with the applicant concerned, provided however that such rejection (without prejudice to the operation otherwise of a quorum under Rule 2 hereof) shall be that of a full Committee. 4. MEETINGS. The Annual General Meeting will be held at the last meeting in January of each year, and at least two weeks’ notice of such a meeting shall be given to the members. The Secretary shall call a Special General Meeting on the written request of not less than ten members, and shall give to members at least two weeks’ notice of such a meeting. Voting at all meetings shall be by a show of hands or by ballot if demanded by not less than six members. In the event of an equal division of votes, the President or his appointee shall have a casting vote. 5. SUBSCRIPTIONS. The joining subscription and annual subscription shall be determined at the Annual General Meeting. This will be due and payable at this meeting. If the Annual subscription is not paid by March 1st, of that year, the membership will automatically lapse. Members who have reached the age of 89 at an Annual General Meeting will become Honorary Members at that Annual General Meeting and not liable to pay any further annual subscriptions. The cost of ties, lapel and name badges shall be determined at the Annual General Meeting. 6. ACCOUNTS. 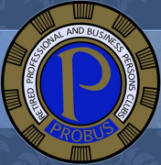 All Club monies shall be paid into The Probus Bank Account, and the signatories will be any two of the following officers, Treasurer, Assistant Treasurer and Secretary. An Income and Expenditure Account for the period to the end of December shall be prepared and presented for approval at the Annual General Meeting, after Independent Assessment by a Professional Accounting Body appointed at the previous Annual General Meeting. 7. VISITORS. The Committee shall determine the admission of visitors.